The BCS III system for disc chippers yields the ideal combination of high performance and low operating costs. The BCS 3 utilizes only 3 primary components… a holder, clamp, and knife. BCS 3s robust/simple design and advanced features make it the perfect system for mills looking to increase production and improve chip quality. 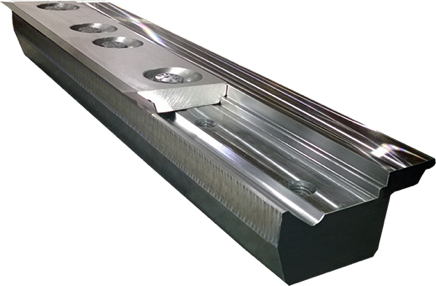 The BCS III Chipper System increases production through a longer lasting knife-edge, and a tough durable design. The new Uni-Ridge Knife has proven to last twice as long as other brands of indexable and conventional knife systems. Chipping operations benefit from less downtime and more production. The knife is manufactured from a modified tool steel for exceptional knife life. An optimal tip to breaker distance enhances chip formation, resulting in improved chip quality. 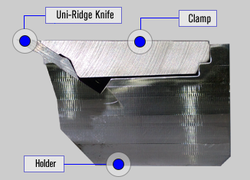 An oversized single ridge located on the bottom of the knife improves chip flow. The knife is indexable and rehonable, eliminating the need for grinding and babbitting.